Has your oven lost its sparkle? If so, there’s a good chance you are not doing cleaning right. Or maybe not cleaning it at all? Cleaning the oven is one of those spring cleaning jobs everyone dreads. However, armed with the right tools, removing sticky burnt-on food and grease should be relatively hassle-free. And while we're on the subject, cleaning an oven once a year won't really cut it: ideally, aim for at least twice a year, more if you can find the time. Follow our simple tips to cleaning an oven, and you will have yours spotless in no time. Use our kitchen cleaning hacks for more handy tips. Once you're done, see all our cleaning buys, how-tos and hacks to keep your home sparkling. Safety first: When using a professional oven cleaner always be aware of the recommended safety precautions on the product and read the instructions thoroughly before use. Always wear rubber gloves and make sure your oven is switched off and cool before you start. Does your oven have one? If you're not sure – maybe you inherited from your home's previous owner – check in the manual (or online if you don't have it). If your oven self-cleans, you start the cleaning process following the manufacturer's instructions. That doesn't mean that you don't have to be involved, though. 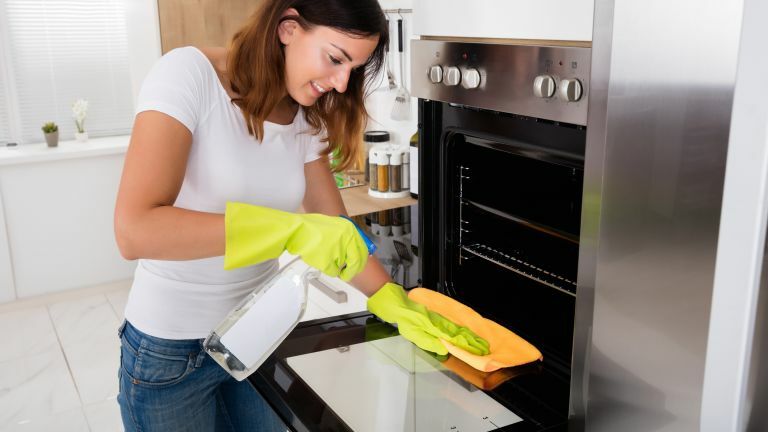 The self-clean function usually means heating your oven to very high temperatures that reduces the burnt on food to ash, that you then have to clean out of the bottom of the oven. Still there's a lot less elbow grease involved. Hot tip? Open the windows – there's usually a fair amount of smoke. Self-cleaning functions aside, you can start cleaning your oven the old fashioned way. First, change into old clothes as oven cleaning can get rather messy and put on rubber gloves. Then, remove any obvious bits of food you can see lying on the oven floor and stuck to the shelves. Quick trick? A damp sponge on a handle or an old washing up brush is good for this. Have a baking tray on the floor beneath the oven to catch the burnt food. You can then just flip it into the bin and pop the tray into the dishwasher. On that subject, find out how to clean a dishwasher, too. Remove all oven racks and leave them to soak in a sink (or the bath if your sink is too small) full of warm, soapy water. The combination of hot water and washing up liquid will help break down any burnt-on food or grease residue. You may need leave to soak for a few hours or overnight. Quick trick? If you are short on time, place the shelves in a re-sealable plastic bag, spray all over with oven cleaner, seal the bag and leave the cleaner to work its magic for 30 minutes. Spray the cleaning product all around your oven, onto the roof, right at the back and in all corners. Leave the solution to soften any stubborn burnt-on food, follow the time recommendations on your product – usually at least 30 minutes, but often a few hours. Natural alternative? If you're wondering how to clean an oven with a natural alternative, it's back to our old friend, bicarbonate of soda. Sprinkle it generously over the oven's surfaces (you might need to dampen them first to get it to stick), then spray white vinegar over the top. Leave for 30 minutes. Use our guides to cleaning with bicarbonate of soda and vinegar to find lots more useful tips. Once you have soaked your racks use a scourer to scrub them clean. Turn them halfway through to make sure that they are spotless on both sides. Rinse with warm water and set aside to dry. Quick trick? Or, make use of some good old Brillo Pads to remove anything really caked on. Once the cleaning product or bicarb/vinegar has had chance to work you’ll notice leftover food has started to loosen. Take a sponge and a bowl of warm, soapy water and begin wiping the inside of the oven. Rinse your sponge in the water and repeat this step until the oven is clean. Rinsing the sponge after each round will avoid spreading dirt. Time-saving trick? Spread a tea towel or newspaper on the floor before you start this step so you don't have to wash the floor afterwards. If you still have grease residue or burnt-on food inside your oven at this stage don’t worry. Simply sprinkle bicarbonate of soda on the scorched food and leave to soften overnight. The following morning you’ll be able to wipe away any stubborn stains using a sponge and warm water. Quick trick? Raid the fruit bowl for lemons, cut four or five in half, squeeze their juice into a baking tray and put the squeezed lemon halves in the tray, too. Set the oven at 250°C and cook the lemons for 30 minutes. The steam from the lemons steam clean your oven. Once it's cooled, wipe it out with a sponge and rinse. To really tackle those hard to reach areas, especially the corners, use an old toothbrush to clean your oven. Soak the bristles with your oven cleaner or use bicarbonate of soda and scrub vigorously. Quick trick? Use the spray bottle to spray clean, warm water into the corners when you're rinsing them of cleaning product. Bicarbonate of soda and vinegar will get burnt-on stains off your stove top, too. Simply sprinkle the bicarb over the stove, then spritz with vinegar. Let this soak in for at least 30 minutes before scrubbing, ensuring the soft sponge you use won't scratch the surface. For the finishing touch you’ll want your glass door to be gleaming. First remove any stuck on food using a glass scraper or scourer. To stop puddles on your kitchen floor, place an old towel under the gap between the oven and where the door opens. Now remove all grease with hot water and washing up liquid or your oven cleaner. Wipe the glass door dry with paper towels removing all cleaning product residue. Never take your door apart. Cleaning stainless steel? Follow our guide on how to clean stainless steel for gleaming results for all your kitchen appliances. Line the base of your oven with foil or an oven sheet before you start cooking. You’ll never need to clean the bottom of the over again! Roast meat and fish in cooking bags or a roasting tin with a lid to stop fat spitting around inside the oven. Always fully remove trays when inspecting food halfway through cook time, to prevent any grease splashing off the side. Leave bicarbonate of soda on top of stubborn stains overnight to remove. After cooking, put a heat resistant bowl of water inside the oven for 20 minutes on a high temperature. This loosens grease so you can wipe the surfaces easily with paper towels or a wet cloth afterwards. Ditching the cleaning to buy a new oven? Find the best oven for your kitchen with our pick of favourite new models – all at the best prices, too. Going for the latest healthy trend for steam ovens to kit out your new kitchen? We've found the best new models. Thinking big? Love the farmhouse look? Want a family-sized oven? A range cooker is a fail-safe investment.